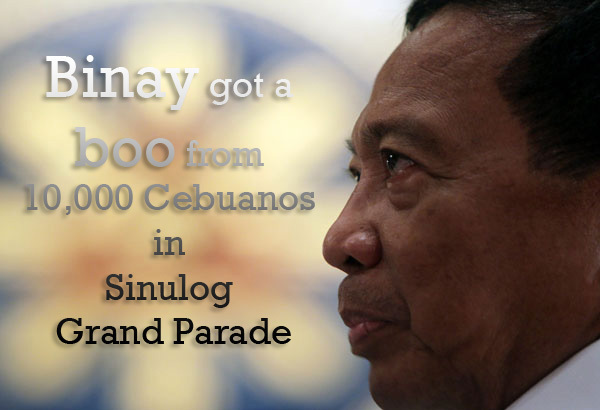 Presidential candidate and current Vice President Jejomar Binay was booed in Cebu City during the opening ceremony of Sinulog Grand Parade last Sunday, January 17. Binay was called on stage by suspended Cebu City Mayor Mike Rama for a remark but was greeted with a boo by 10,000 people inside the Cebu City Sports Center. Thus, Binay just greeted the Cebuanos, "Maayong buntag sa inyong tanan! (Good Morning everyone)" and promptly finished it with, "Viva! Pit Señor!" with his fist shot high. VP Jejomar Binay together with his running mate Gringo Honasan, suspended Makati City Mayor JunJun Binay and Senatorial aspirants Alma Moreno, Harry Roque and Princess Kiram went to Cebu to witness the annual Sinulog festival. The jeer was allegedly initiated by the local Liberal Party according to United Nationalist Alliance spokesperson, Joey Salgado. In an interview with GMA news, Salgado said that LP could have been sulking because Binay is leading the surveys even in the Visayas region. Binay has topped the latest SWS survey for Presidential candidates with Chiz Escudero as the leading Vice Presidentiable. Cebu City Governor Hilario Davide III's spokesperson refuted Salgado's assertions and said that the LP contingent was with Governor Hilario during the jeering and wasn't inside the CCSC yet. On the contrary, GMA news said that Cebu Vice Governor Agnes Magpale, an LP member, was on the stage already when it happened. With all of that behind, the culmination of the 10-day Sinulog festival in Cebu was still considered a success. Participated with dancers, floats, higantes and puppeteers, the Sinulog Grand Parade started and finished at Cebu City Sports Center.